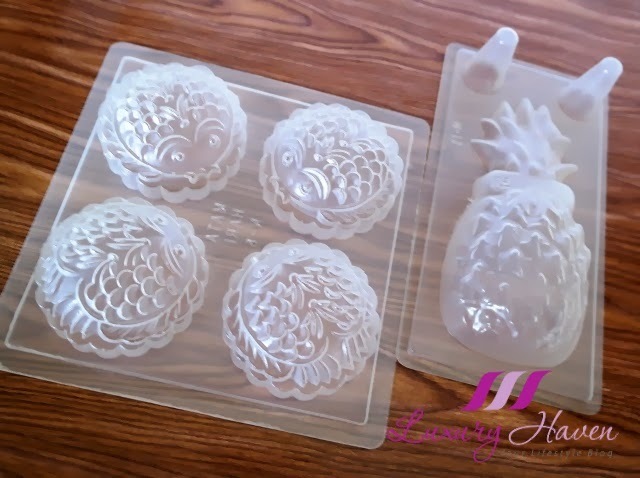 I received these jelly moulds from one of my ex-students, Hui Un. The sweet lady spotted these in Malaysia, but didn't know my preference, so she bought them all just for me! Aren't I lucky to be pampered by my students? Well, I picked these two moulds for making my dessert. 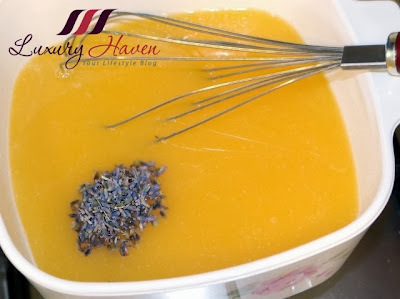 I've some Dried Lavender given by Gryphon Tea sometime ago, and thought it would be a great marriage between mango and lavender. 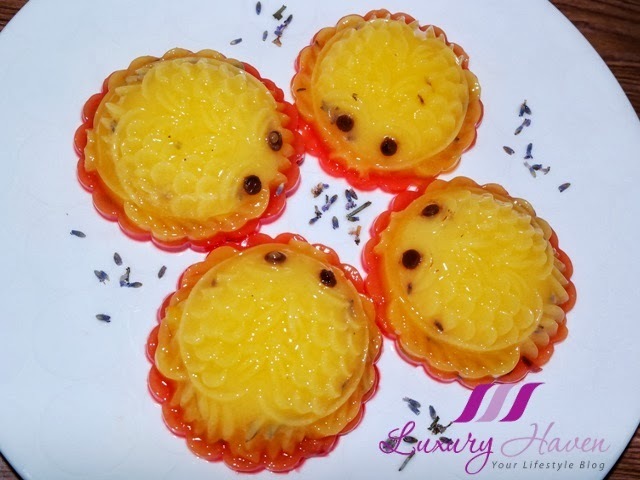 The result was an aromatic pudding with beautiful flavours from the mango and lavender! Don't you think these fishes are so cute? 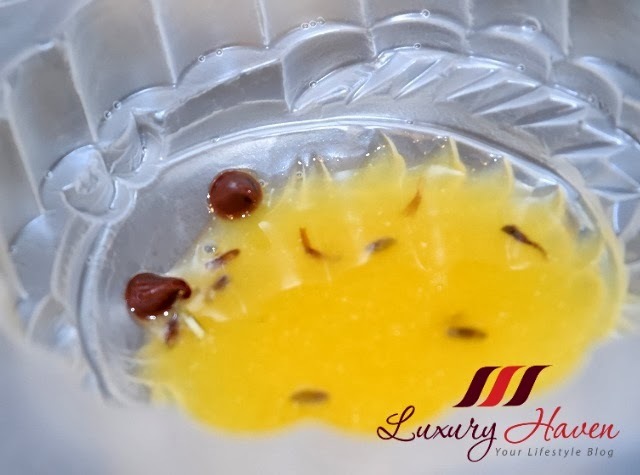 Lavender is very strong, so your mango pudding will be overpowered if you're too generous with the lavender. 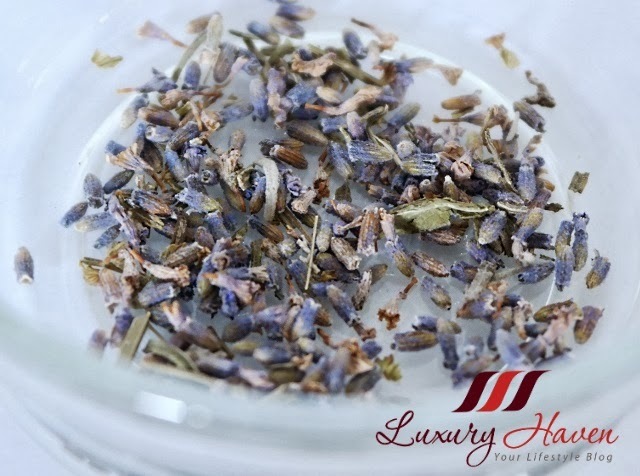 For the pudding, you can choose to discard the lavender after extracting the flavours or leave it as it is like this recipe. Soak lavender for 2 - 3 hrs. 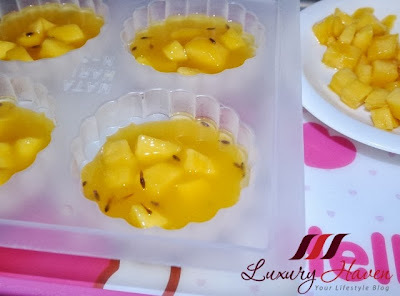 Cut mango into cubes and set aside. 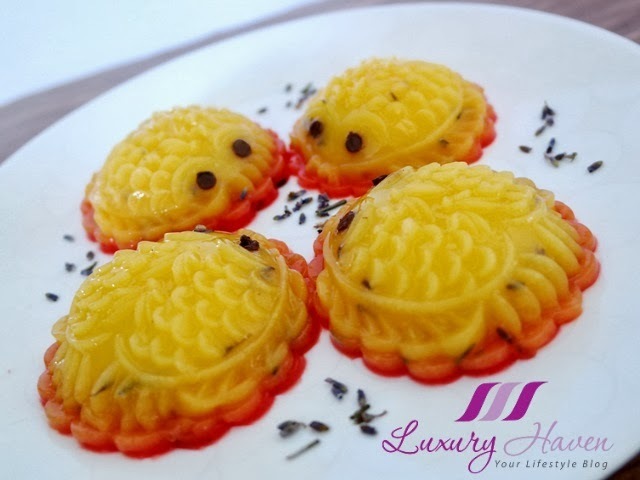 Cook mango pudding according to manufacturer’s instructions. Add lavender and simmer for about 5 mins, stirring occasionally. 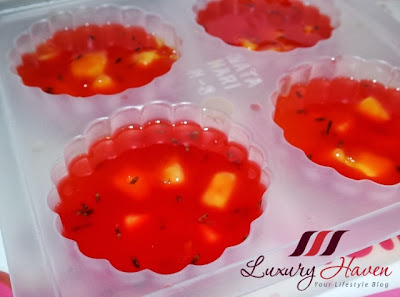 Pour mango mixture into moulds until it reaches the eyes. Lightly dip chocolate into mixture and insert into the eye inlet, one by one. Be careful, the chocolate will melt if the mixture covers the eyes completely at this stage as it's too hot. You need to wait till mixture's slightly cooled, then spoon it slowly over the eyes. Alternatively, you can use raisins too. Let the pudding cool and set in the fridge. Remove pudding from fridge when it hardens a little. Add fresh mangoes and fill the mould with more mixture. If you like to have colour variations, you can add red colouring to the remaining mixture and fill the top part of the pudding with it. Let it cool and refrigerate. Transfer these lovely fishes onto serving plate and serve chilled with evaporate milk if you prefer! I've used the extra mixture to pour into my pineapple mould. Isn't it pretty too? 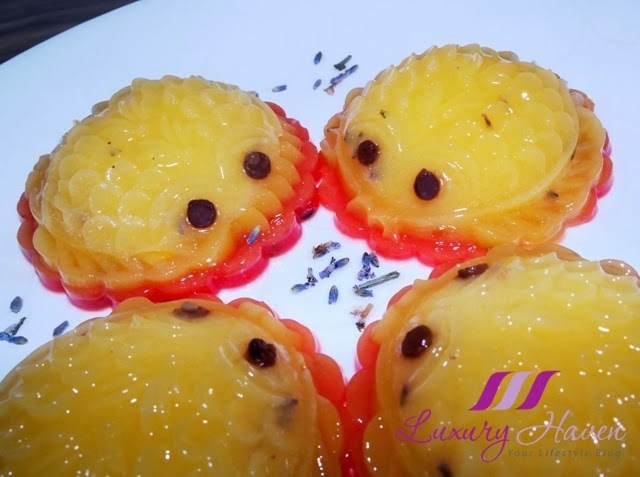 If you can't find lavender, you may simply omit the dried flowers or make this stunning Lucky Koi Mango Pudding (吉祥錦鯉芒果布丁) instead. Enjoy! I Don't get lavender here, I will try it by omitting it. Subha, mango pudding is real tasty! You can certainly do without the lavender too. Aren't they just the most adorable cuties or should I say fishies, lol...How sweet of your student to gift you with so many molds. I can tell you sure are going to have fun with them! SD, thanks for your lovely note! You're very generous with the fresh mango cubes. 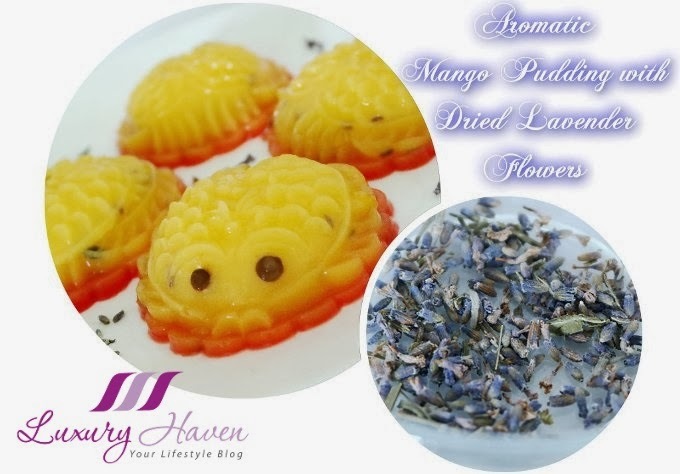 I've not tried lavender in food before except for aromatherapy essential oil. Looks interesting. 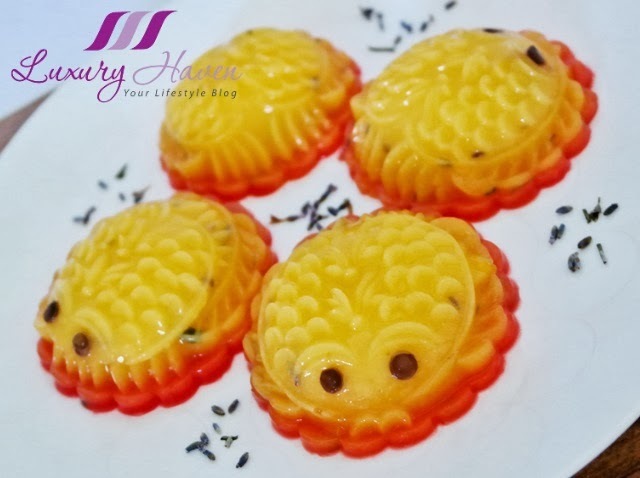 Guess what, those mould that your student got for you was originally moon cake mould You could find lots of them during the moon cake festival. DS, you've to try someday. Great for cakes too! 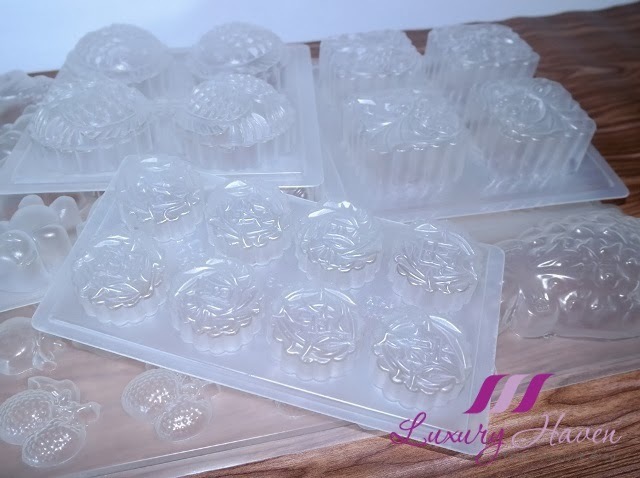 Yes, some of those are mooncake moulds. Since it's not moon festival, thought it's great for jellies too! Ken, that's true! It's also much easier to find osmanthus. wow! i love mango flavour..
cquek, I love mango pudding! 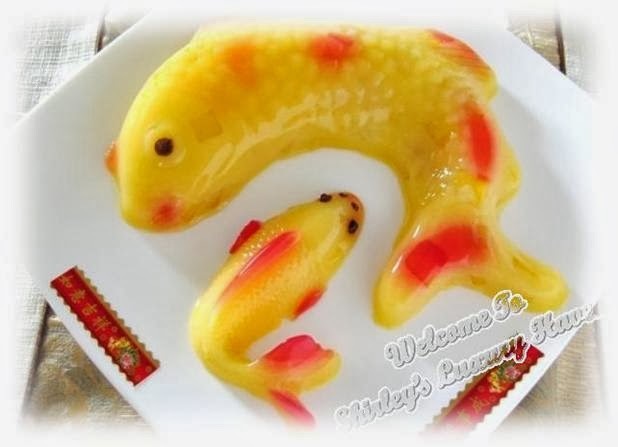 Wow, you are so talented cooker~ These sweets looks so, so yummy and cute! ^w^ I love mango!! Rinako, thanks for your lovely comment! Glad you like it too! Amazing and so refined! I wouldn't be able to do these.. no patience in me when it comes to cooking.. LOL.. but I love to see and admire these delicate desserts! Reana, take it as a bonding session with your kids! Hahaha! Hi Shirley! You make very pretty and cute puddings. Unfortunately, I don't like the scent of lavender in food. So I guess I would leave it out and enjoy just the yummy mangoes! Lucky you with all the new molds! Your fish are adorable!!! Liz, thanks sweetie! Have a good weekend! Hi Shirley, I'm back! Sorry for not dropping by for the past 2 months, now I got lots to catch up. Those pudding sure look refreshing and cute. Lovely colour too. Lucky you, got so many beautiful mould. Amelia, no worries at all! Better late than never. Thanks so much for your strings of consecutive comments! That's really creative, Shirley! =) Since I have leftover gelatine powder, I could probably adapt your recipe and substitute mango for milk. ^^ I can't quite stomach mango because it'll give me intense stomach ache after eating it. Ciana, so sorry to learn that you can't take mango. 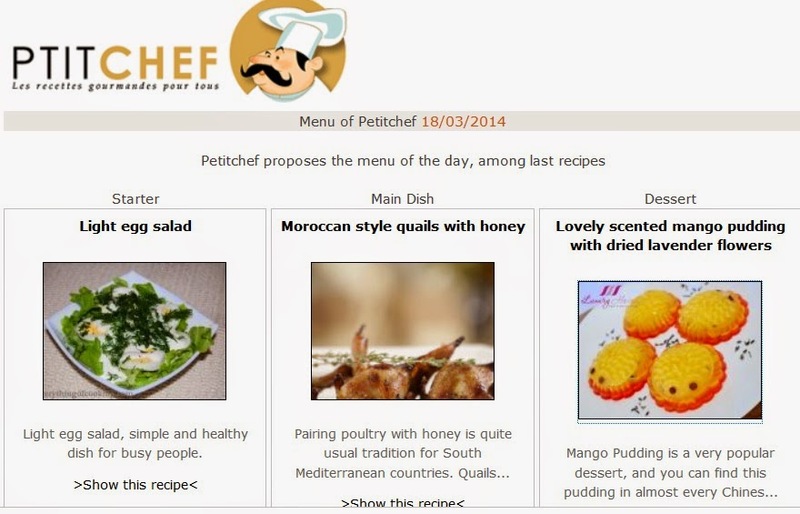 You could take a look at other dessert recipes here for some ideas. Don't worry about it, studies are more important. All the best, sweetie! Kylie, thanks & have a good day! 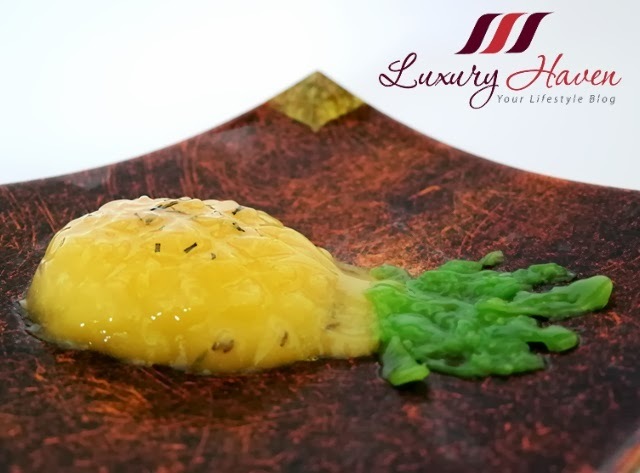 The mango pudding is absolutely divine. my better half doesn't like lavender, if not mistaken he got allergy to it. Yee Ling, I've to admit not many can take the taste of lavender. You can always omit that. Andrea, apology for my tardy response; I must've missed this. Hopping over now...... Thanks for visiting!